I’ll begin with the disclaimers. 1. I am not a professional movie reviewer. In fact, this is my first ever written movie review. I didn’t read any of the reviews, professional or otherwise, about “The Post” before or after I saw it. I didn’t talk with anyone who had seen the movie before I saw it either. I went to “The Post” with only faint recollections of those days and the events that occurred decades ago in my formative years. 2. I have always had ink in my veins. Growing up in suburban blue-collar Canton, Ohio, a neighbor lady called me “The Beacon Journal” in honor of the respected Akron, Ohio daily. I took her title as a compliment. As a youngster, I was always the first to know what was going on in our busy neighborhood bursting with post-war children. When the siren at the volunteer fire station three blocks away sounded, I often was the first one to arrive, wanting to know what was burning. Careful to stay clear of the trucks, I’d follow them on my bike if I could or sneak a peek at the chalkboard inside the door to the firehouse where the info about the call was scribbled. 3. I majored in journalism at Kent State University, graduating a year before the infamous shooting. While there, I was both the campus stringer for The Plain Dealer, once the premier newspaper in Cleveland. I also was a student reporter for the Daily Kent Stater, a requirement for journalism majors. Kent State was a magnet for political activism in the tumultuous 1960s. It all swirled around me, a naïve, young student taking it all in one event at a time. I reported what I observed about student war protests and couriered photos and copy from Kent to Cleveland. 4. 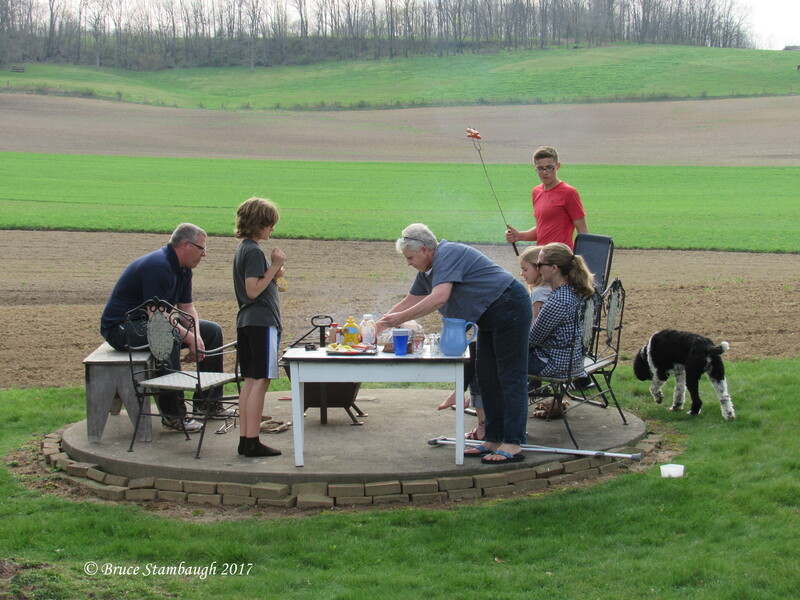 My first career spanned 30-years in public education in Holmes County, Ohio, filled with a dynamic mix of Appalachian and Amish/Mennonite cultures and their historical quirks. Still, I kept the ink in my veins flowing by serving as the information officer for local volunteer fire departments. I also continued to write feature stories for The Plain Dealer and local newspapers. I served as co-editor for 12 years for the magazine of the Ohio Conference of the Mennonite Church. 5. 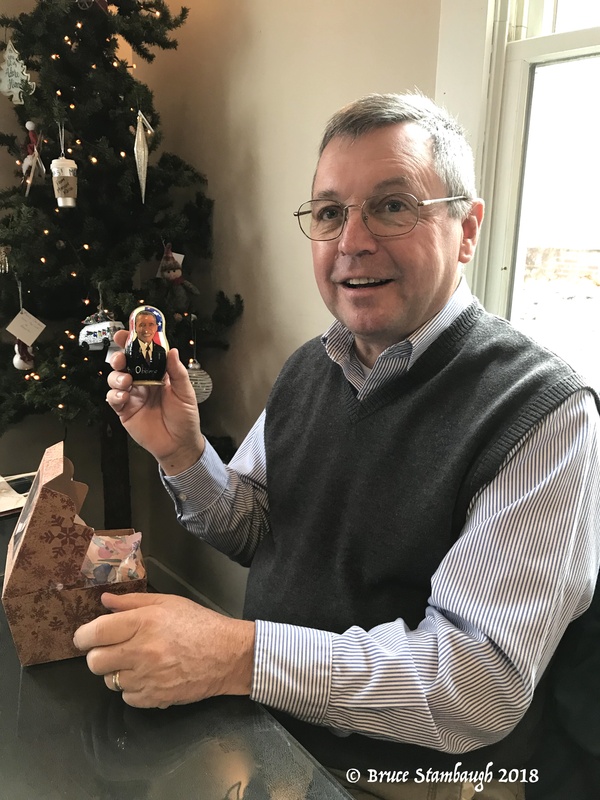 After retiring as a school administrator, I began using my journalism background full-time by serving as public relations/marketing coordinator for a local retirement community and as a marketing consultant for an Amish-owned furniture business. And I have been writing a weekly newspaper column since 1999. Whether Steven Spielberg, the movie’s director, used creative license in the storyline of “The Post” is insignificant. I can’t know if Ben Bradlee schmoozed with Jack Kennedy or not, or whether Kay Graham and Robert McNamara really were good friends. I didn’t research it. I didn’t even Google it. All I know is this: With marvelous performances by Meryl Streep and Tom Hanks, “The Post” put the importance of our first amendment rights of a free press front and center. What was critical then is even more so today, especially given today’s tense political situation and a president who seems incapable of understanding or separating the roles and responsibilities of each branch of government and a free press to report to the citizenry. Given my background, I know personally how important that Supreme Court ruling was. Justice Black’s words, speaking for the majority, reaffirmed my beliefs, my life as a tiny, trivial citizen in this fantastic country of ours. No president from Truman to Trump, no person or organization from Bannon to Breitbart, can silence the truth. If they do, our democracy is doomed. It’s that simple. To me, that was THE point. As the credits rolled at movie’s end, the memories were vivid, the emotions raw and real, and tears flowed. After the movie, I sent a text to my son saying that “The Post” was the best movie I had ever seen. He thought that strong praise indeed. I explained by saying that it connected the dots of where we are today politically back to the Civil Rights/Vietnam era, the time that most formulated the person I am today. Watching those scenes, hearing those secret Nixon tapes, having all of those names come tumbling off the screen and into this 70-year-old brain somehow finally made it all make sense to me, brought me peace amid the chaos of where we are today. I felt fulfilled, closure, and hope all in one emotional release. 6. I was once mistaken for Spielberg in Phoenix Sky Harbor International Airport in Arizona. The person refused to believe my denial, and my companions couldn’t stop laughing. Regardless of your politics, go see “The Post.” I hope it will set you free as it did me. I’ll admit that I wasn’t too happy when Holmes County, Ohio decided to number their highways instead of using names. That occurred when the house numbering system was employed decades ago. I maintained then and now that people remember names much better than numbers. Plus, local residents already referred to many of the rural roads by using a name. 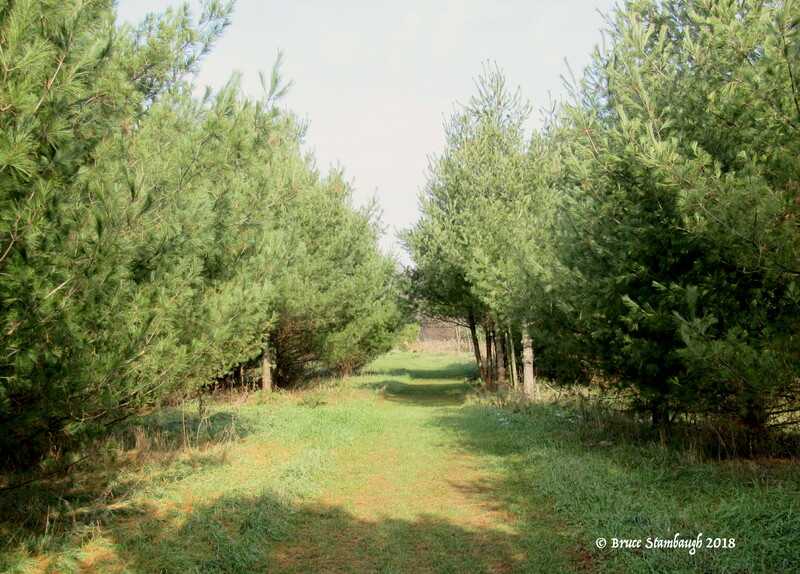 If you said French Ridge Road, Weaver Ridge Road, Cherry Ridge Road, Number Ten Road, Goose Bottom Road or the Charm Road, most folks knew where you were talking about. Even today when you throw out a number, you often get blank looks. My logic fell on deaf ears of county officials. Instead of those practical and appropriate names, the good folks and businesses of Holmes County got stuck with numbered roadways. But if a stranger asked a local for directions to see the cabin built on a rock, they’d probably be told to turn off of Dundee Road onto Trail Bottom Road. 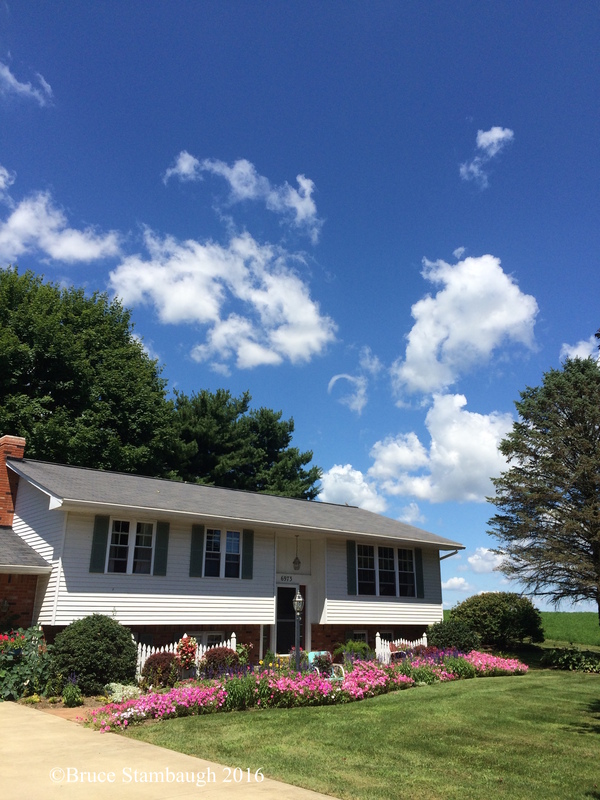 I was delighted to see that names triumphed over numbers in our new home in Rockingham County, Virginia. The roads are also numbered, but their names prevail. Only numbers identify the main routes like I – 81, US 33, and State Route 42. The rest use the beautifully colloquial names that make perfect sense. 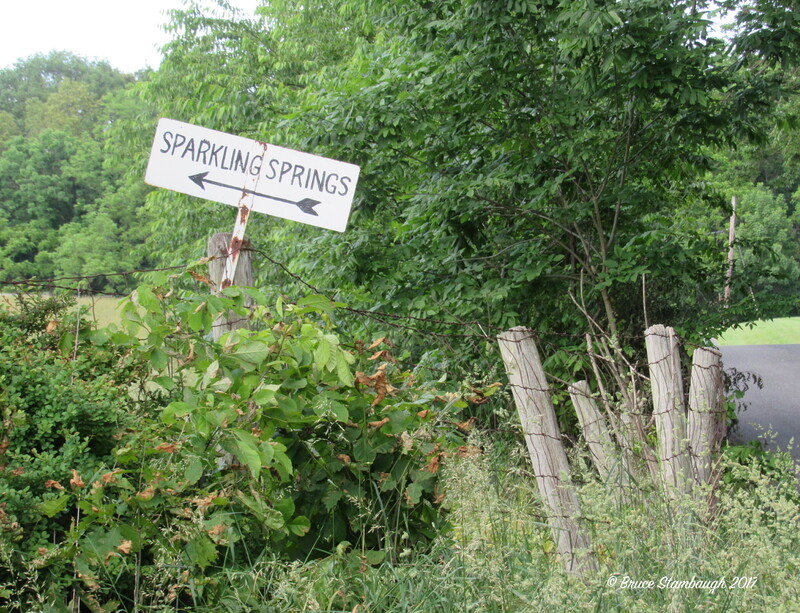 This way to Sparkling Springs. Wonderful names you couldn’t invent don street corner signposts. They’re practical and memorable, which is what a road name should be. Keezletown Road leads to Keezletown. Silver Lake Road begins at Silver Lake near Dayton. Sparkling Springs Road dead ends into Sparkling Springs. See what I mean? I feel like I’ve landed in Utopia. 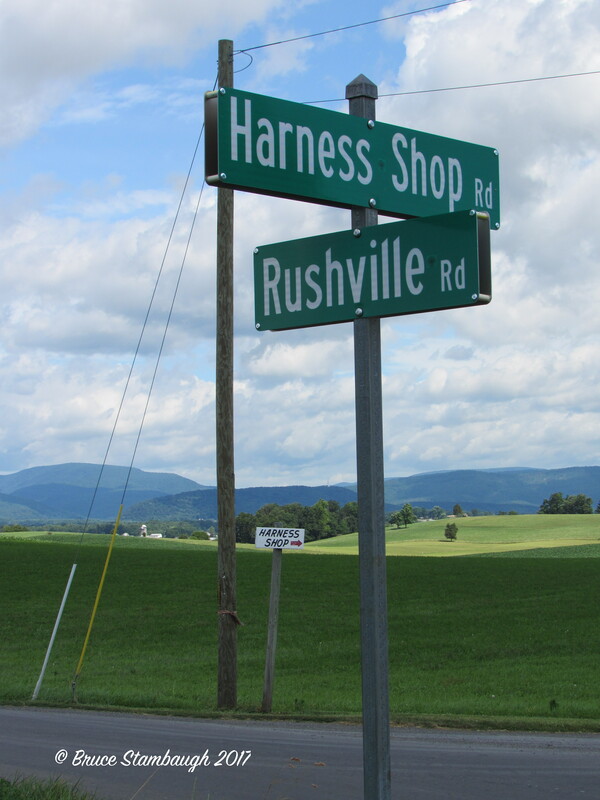 Even if you’ve never been to Rockingham County, Virginia, you probably can figure out what business is on Harness Shop Road. Singers Glen Road runs right through Singers Glen. And the village got its name because of people singing in a glen. That’s about as practical as it gets. Mole Hill Road only takes you to one place, Mole Hill. It’s a well-known landmark that predates human history. Whether going east or traveling west on Mt. Clinton Pike, you are sure to drive through the quaint village of Mt. Clinton. Even the parks say what they mean. Natural Chimneys State Park is home to an ancient sedimentary rock formation that highly resembles chimneys. Many even have an opening like a hearth at their base. And the road that leads you to the park? Why Natural Chimney Lane of course. There’s also Whitmore Shop Road, Muddy Creek Road that parallels Muddy Creek, and Fog Hollow Road. No guessing where that goes. There used to be a mill on Wengers Mill Road. And yes, the view on Majestic View Road is majestic. Now some places are intriguing but leave me wondering just how they got their names. Briery Branch, Ottobine, Clover Hill, Penn Laird, and Cross Keys are some examples. In time, I’ll likely find the answers. It’s just that having lived in Holmes County all of my adult life, I know towns and valleys and ridges are similarly named. Killbuck, Glenmont, Nashville, Beck’s Mills, Farmerstown, and Limpytown would be a start. Spook Hollow, Panther Hollow, Shrimplin Run, and Calmoutier each have their own particular piece of Holmes County folklore. Roads and towns with names that recall historical times are both fun and fascinating. In a way, they help solidify a sense of community. People can identify with them. Names like that connect the past with the present. That’s something a number simply can’t do. 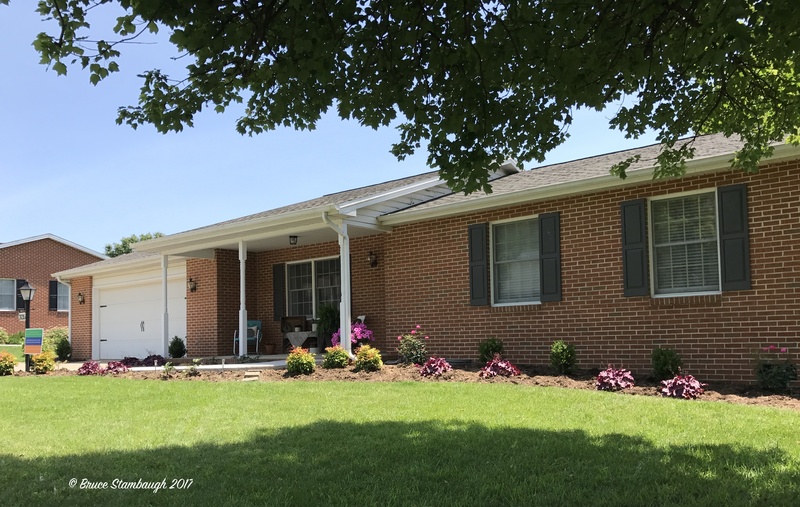 It’s been a little more than a month since we moved from our beloved home in beautiful Holmes County, Ohio to our new place of residence in Virginia’s lovely Shenandoah Valley. We knew there would be similarities. We just didn’t know they would abound. We learned to know the area long before we moved. 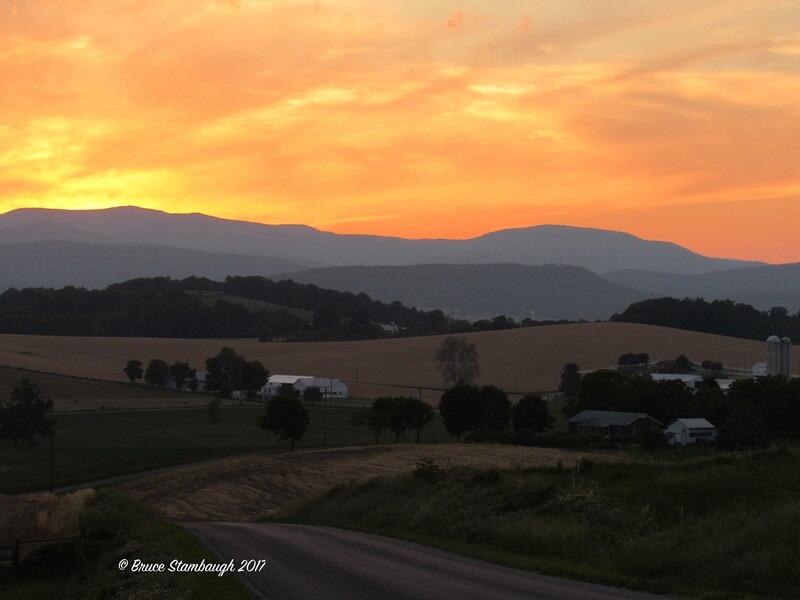 Our daughter attended college at Eastern Mennonite University in Harrisonburg. She met her husband there. Now the school employs both of them, Carrie as a coach and Daryl as part of the administrative team. In the few weeks that we’ve lived here, we have learned first-hand just how similar Holmes County is to Rockingham County. Those likenesses transcend the beauty of each locale. Both have wooded rolling hills. Numerous creeks snake through luscious, productive farmland. Not surprisingly, the same staple crops are grown here, which makes sense since we are in the same growing zone. Field corn, alfalfa, wheat, oats, and soybeans create a patchwork of verdant colors. Produce stands dot the countryside here, too. Livestock includes dairy cows and beef cattle, pigs, sheep, and goats. Long, silver poultry houses can be found high and low across the rural areas of Rockingham County. In Holmes County, they’re mostly white. My guess is that turkeys far outnumber humans in The Valley given the number of those barns I’ve seen. Agriculture is a major economic force for both locations. Consequently, every now and then when the wind is right we get an acrid whiff that reminds us of home. 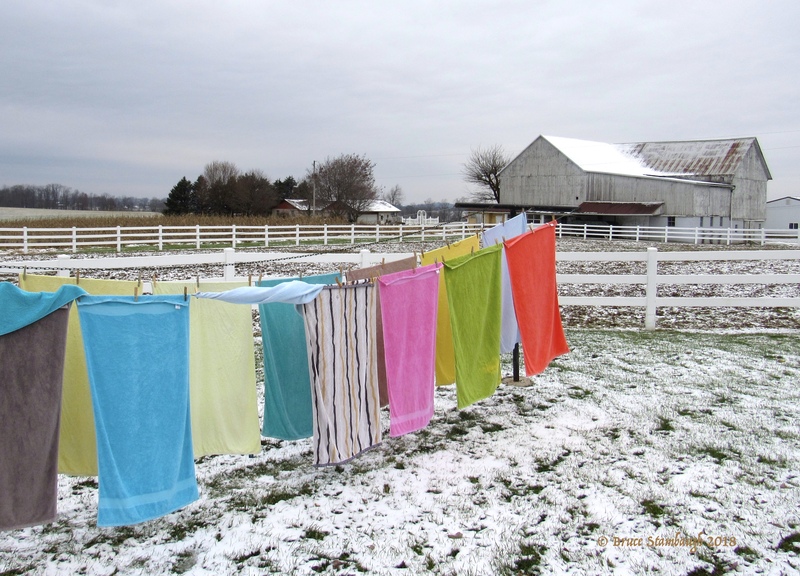 However, we don’t need a breeze to inform us when the barns have been cleaned. 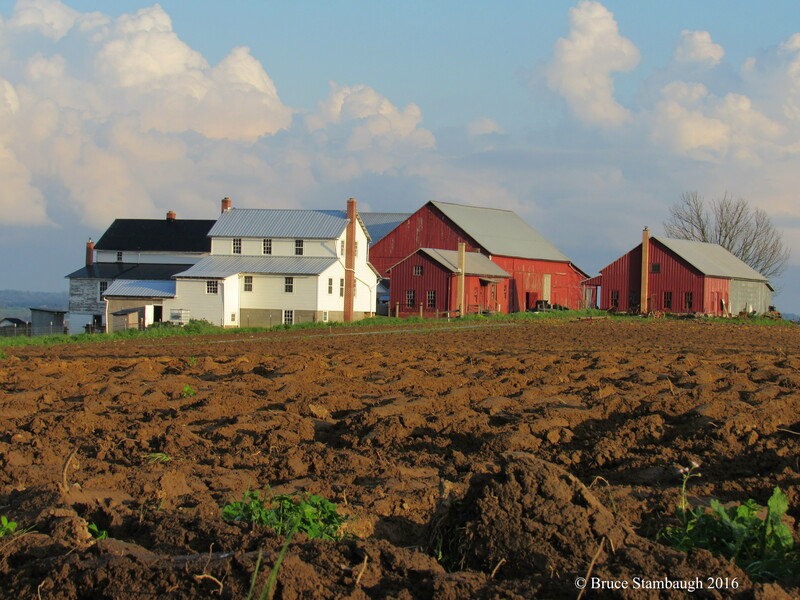 Just like in Ohio, our house is built on what was once farmland. Only instead of a few neighbors, we have many. We are one of nearly 500 households in our development. 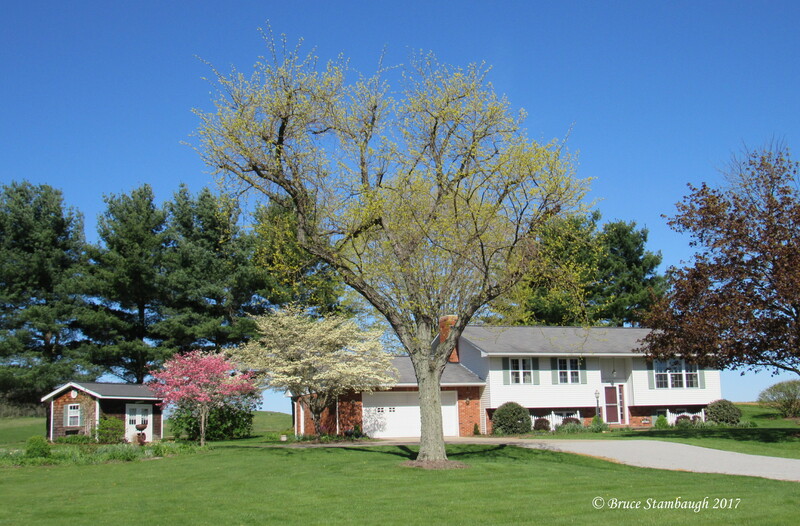 Mature trees and manicured lawns predominate around well-maintained homes. People take pride in their property here with equal zest. In Ohio, airliners sailed regularly over our home on final approach to Akron-Canton Regional Airport. In Harrisonburg, we have the same effect only more frequently. Jets fly overhead, only higher, on approach to Dulles International Airport. Unlike our old home, all of the utilities in our housing development are buried underground. There are no streetlights, though. On a clear night, we can actually see the stars better here than we could at our former home. There are other obvious differences of course. Rockingham County is twice the size of Holmes County in both square miles and population. 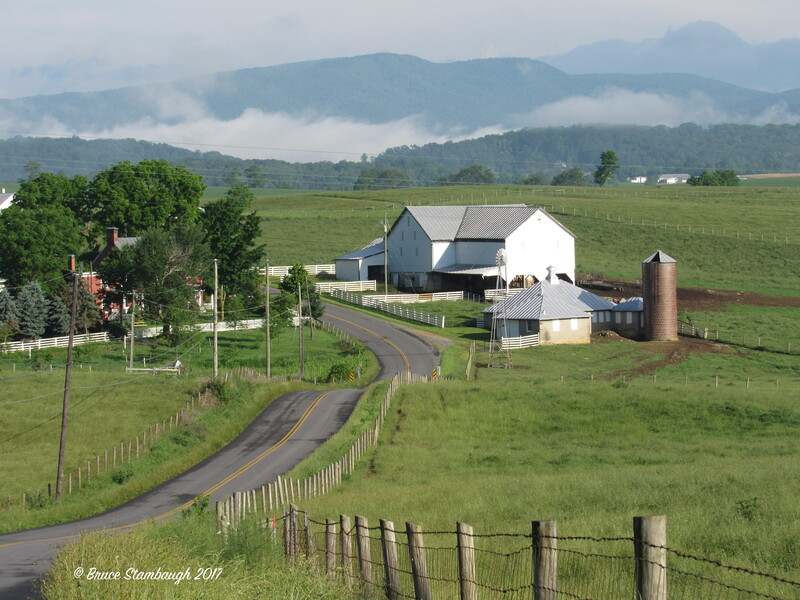 The boundaries of Rockingham County boast the Allegheny Mountains on the west and the Blue Ridge Mountains to the east. 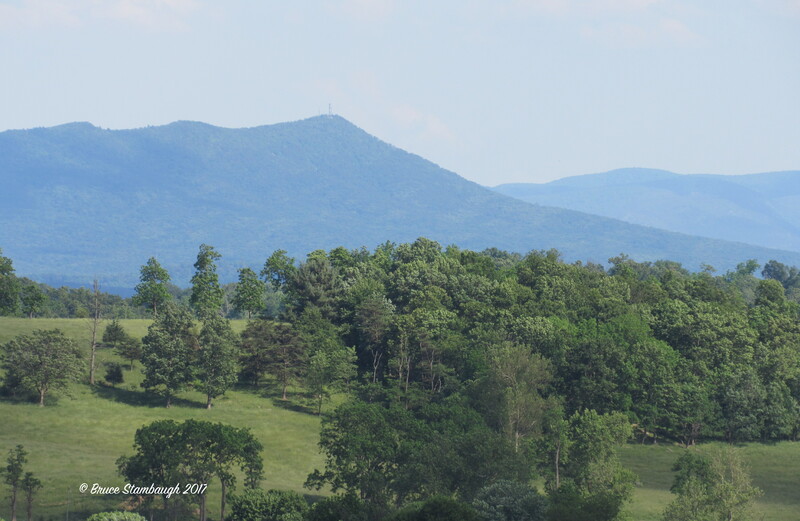 The Massanutten range runs north to south through the center of the county, stopping east of Harrisonburg. It should be noted that the hills of Holmes County are actually the western foothills of the Allegheny Mountains. So we are literally geologically connected. Once outside the city, the roads of Rockingham County are as narrow, windy, and hilly as those of Holmes County. 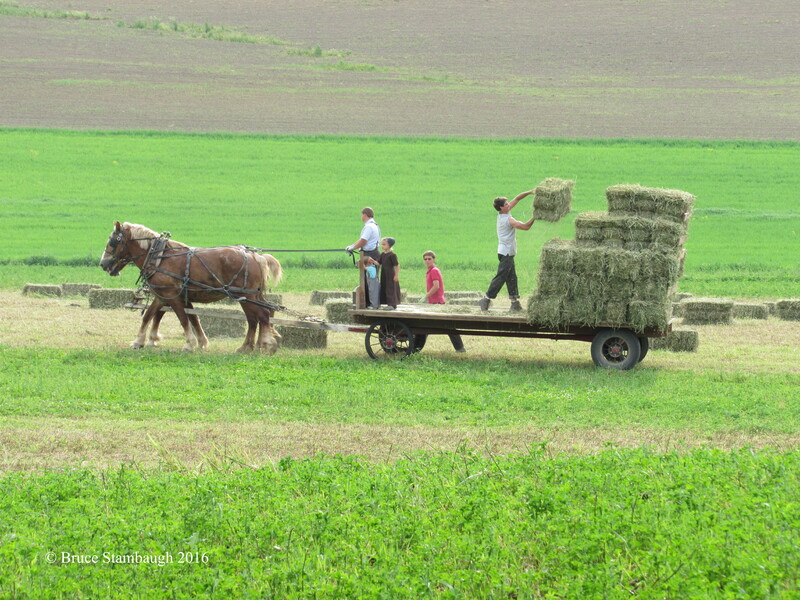 With Old Order Mennonites thriving in the fertile valley, horse and buggies are nearly as common as in Holmes County. The culture, local mores, and values are similar as well. Our neighbors exemplify that daily with their friendliness. Purchasing our home here foretold the familiarity. At the bank, we got our house loan from Julie Yoder. Emily Miller led the house closing. Jayne Schlabach was our realtor. There’s even a Joe Bowman car dealership. In Holmes County, he’d likely be selling buggies. No need to feel sorry for us. We feel right at home in Virginia. 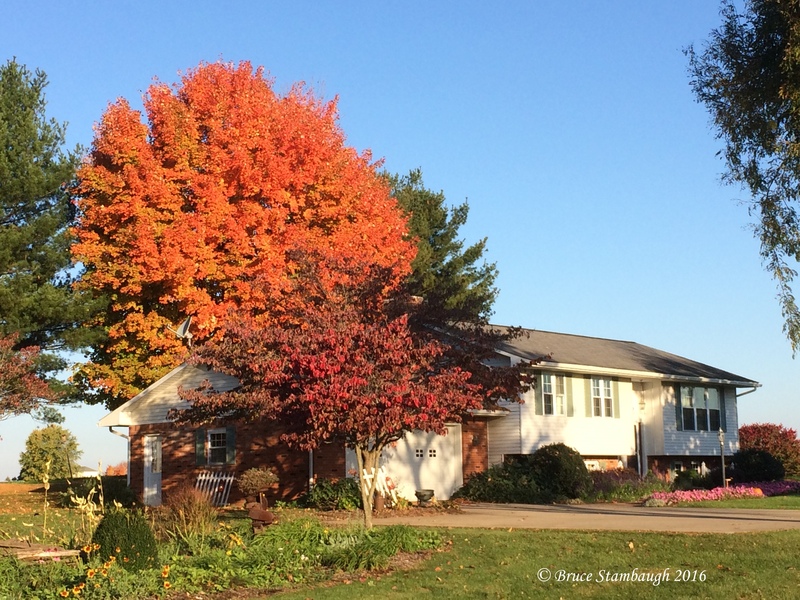 That old house in the fall. 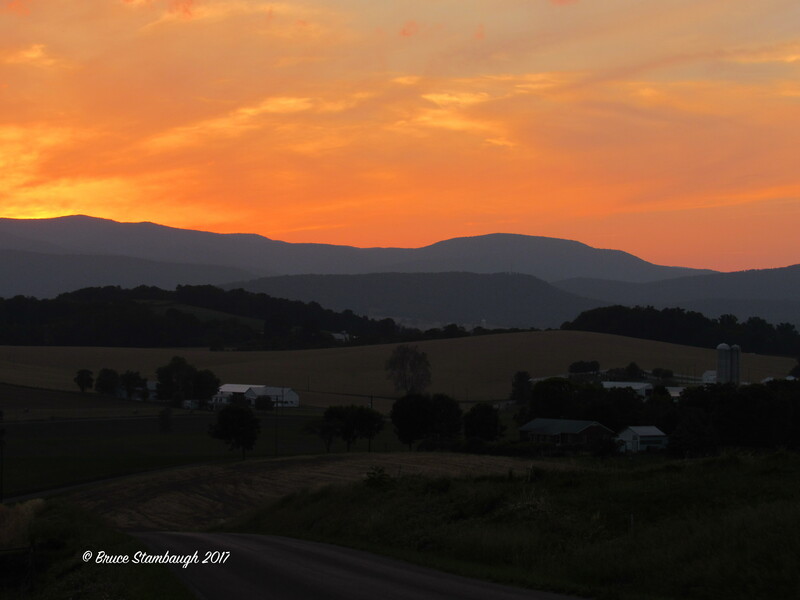 By the time you read this, my wife and I will be settling into our new old home in Virginia’s Shenandoah Valley. We’re excited about the change as we enter the autumn of our lives. We’ll do our best to keep in touch with our friends and relatives in Ohio and elsewhere. They have been the fibers that helped stitch our lives together. Of course, we will miss our old home, too. It served us well for 38 years. That’s a long time by today’s standards where Americans move on average of 11 times. 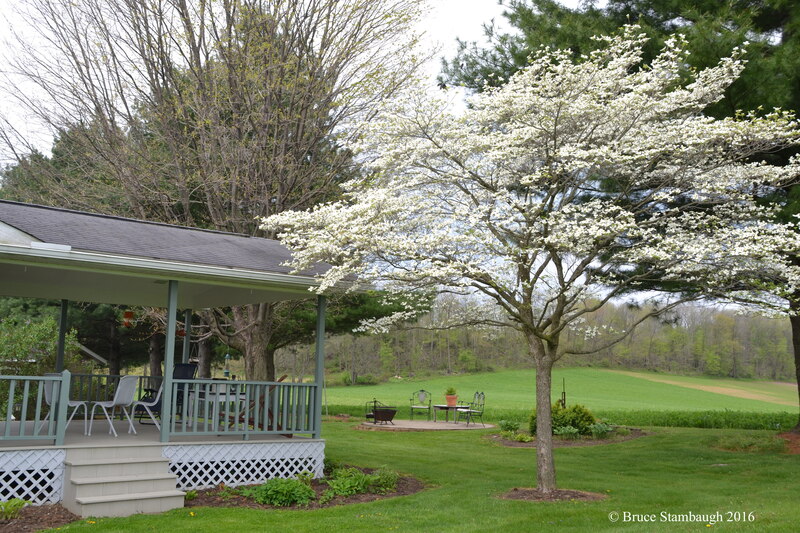 When we bought our home in eastern Holmes County, it was as young in housing as we were in parenting. The house was unfinished and budding, like our two and four-year-olds. Neva and I had been married eight years. That old house helped us raise our daughter and our son from toddlers into productive young adults. It served as ground zero for my amazing wife to hone her effusive hospitality skills. Our former home holds more memories good and bad than I can recall. But it knows. The house’s walls harbor nearly four decades of our personal saga. The house has a beautiful setting that we so enjoyed. 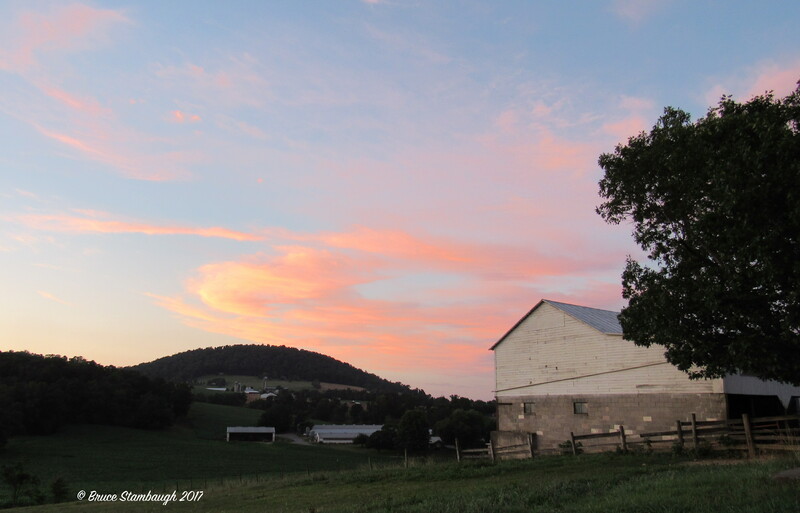 We had excellent views of our Amish country surroundings. We could see five miles north to Wayne County. To the east, explosive sunrises stirred our bodies and our souls into another day. To the west, sunsets often thrilled us far beyond their beauty. To the south, our road still looked like an Olympic ski slope as it curved up, then flattened out, and then quickly back down past our house. 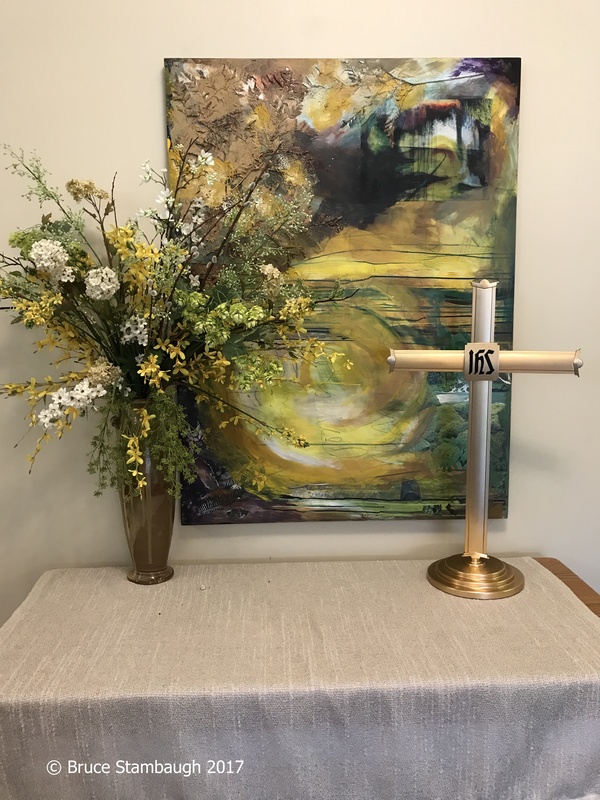 The property itself was a sanctuary. People often complimented Neva on her annuals and perennials that kept the old place bathed in colors spring to late fall. 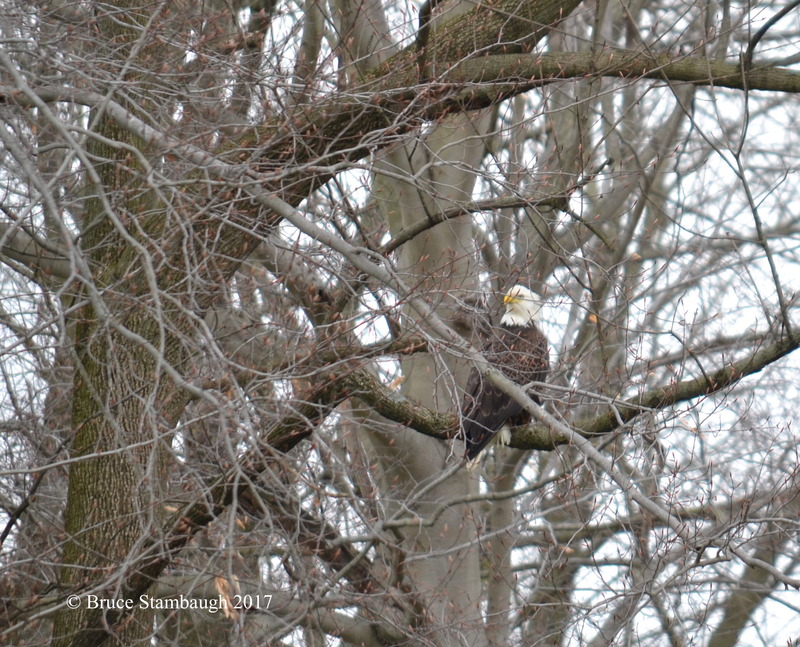 The many trees and shrubs I planted matured, providing habitats for wildlife I never could have imagined. The skunks and raccoons could have found other homes though. The many birds, however, were always welcome. The old house endured many storms over all the seasons and years as Nature used her full arsenal. Deep snows, large hail, six different lightning strikes, damaging winds, earthquakes, and the severe ice storm of late December 2004 pounded away. They all altered the property but could not subdue it. The most memorable events though weren’t earth shattering at all. They were the everyday, common occurrences. Crackling fires in the fireplace on a cold winter’s night; sleepovers; the productive, magical hum of Neva’s sewing machine; both planned and impromptu visits from friends, neighbors, and church youth groups, and the whoosh of chimney swifts that rattled the glass fireplace doors only begin the recollections. Fall flower garden. 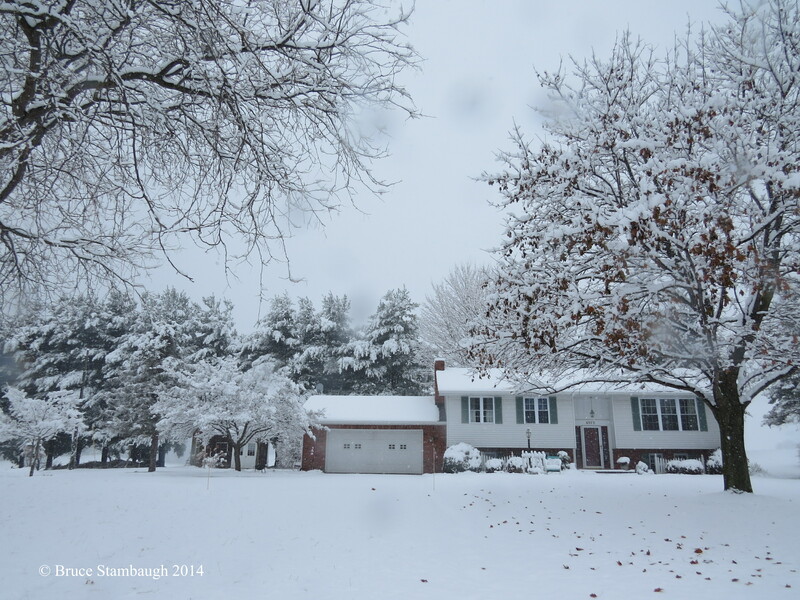 © Bruce Stambaugh 2014. 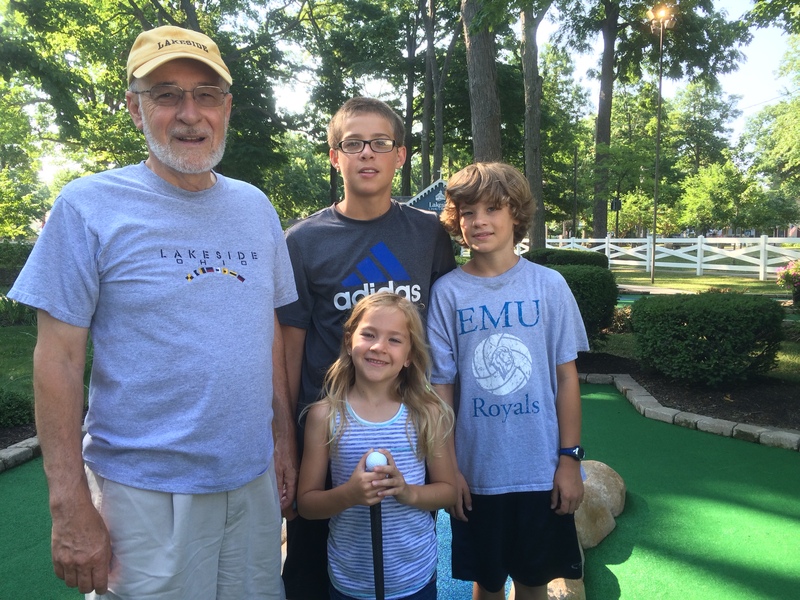 None of those, however, can hold a candle to the memories of the grandkids. They were mesmerized by the clop, clop, clop of horse and buggies trotting by, rosy-cheeked from snowball fights and sled rides, giddy with wonder and excitement on Christmas morning. After all, the grandchildren are the main reason we uprooted ourselves from all that we have been. They are the reason we will settle into new routines, new roles, and our new home in the picturesque Shenandoah Valley. Time is short. Neva and I have chosen to fill our elder days with the activities, joys, and disappointments, competitions and achievements of our progeny’s children. Those will be the sights and sounds, fragrances and satisfactions of all our days ahead, however many or few they may be. Perhaps those memories will be just as sweet, if not sweeter than those generated by that old Holmes County house we called home. They will not, they cannot replace them. We wish the new owners well and hope their memories are as fruitful, meaningful, and lasting as ours.